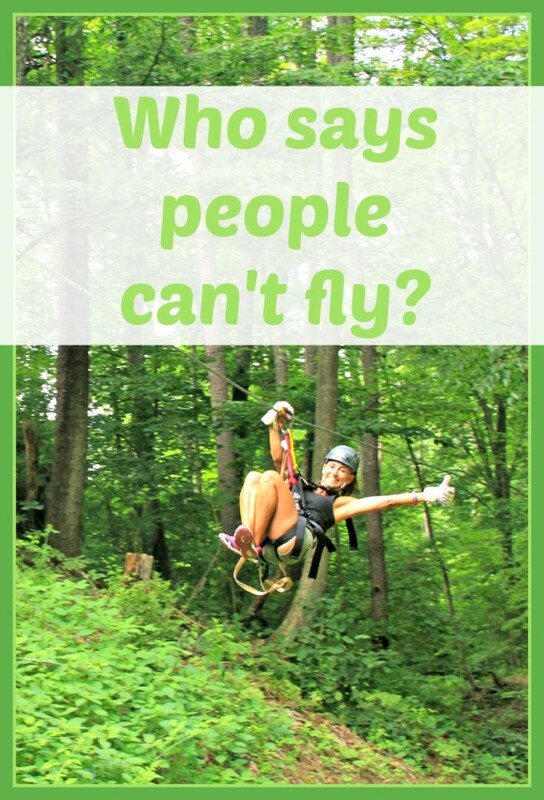 Home » Ohio » Who says people can’t fly? Southeastern Ohio’s coal country, the company is dedicated to preserving the area’s natural beauty and educating guests about trees, wildlife and the rivers in the area. One of my guides, CJ, threw in a history lesson too! The original tour kicks off with a 1.5 mile scenic drive to the beginning of the course. Three hours later, you will have enjoyed 10 zip line “flights,” crossed 5 adventure sky bridges and rappel back to solid ground. For many, the mix of zip lining, sky bridges and rappelling make this the perfect outdoor experience. The X-Treme Zipline, a new tour this year, offers thrill seekers more flight time. This course uses a combination of tree platforms and tower platforms to send adventurers “flying” over — and into — some of the Hocking Hills’ natural features. I tried this course and absolutely loved it! The first few zip lines on the course are fairly tame, zipping through pine trees and across fields to acclimate riders to the experience, but then it revs up big time! We zipped over a stream into a cave. Can you imagine flying into a rock wall? Don’t worry! The expert crew keeps you safe. This tour takes riders over the Hocking River twice — on the final zip, riders fly above the river for several hundred feet, soaring above the kayakers on the river. Super cool! The Super Zip is even more incredible than the final run on the X-treme Zipline! I almost chickened out, but there was a little kid on the platform riding for the third time. And, well, I’m just too competitive to let a 10 year old show me up! Besides, she said it’s the “funnest thing on the planet.” The hardest part about the Super Zip, besides staring face down at the ground 80 feet below, is getting harnessed in. That contraption is quite elaborate…. Of course, that means it’s also quite secure! After getting strapped in, riders lie in the contraption face down. Then, the tour operator trips the safety lever releasing riders to fly more than a quarter mile to the finish platform. The rush of that ride was incredible. For all these adventures, there are height and weight requirements. Minimum weights are required simply because riders who don’t weigh enough won’t create enough momentum to fly through the course. Blame Sir Isaac Newton for that one — he discovered gravity. Maximum height and weight is set for harness safety. 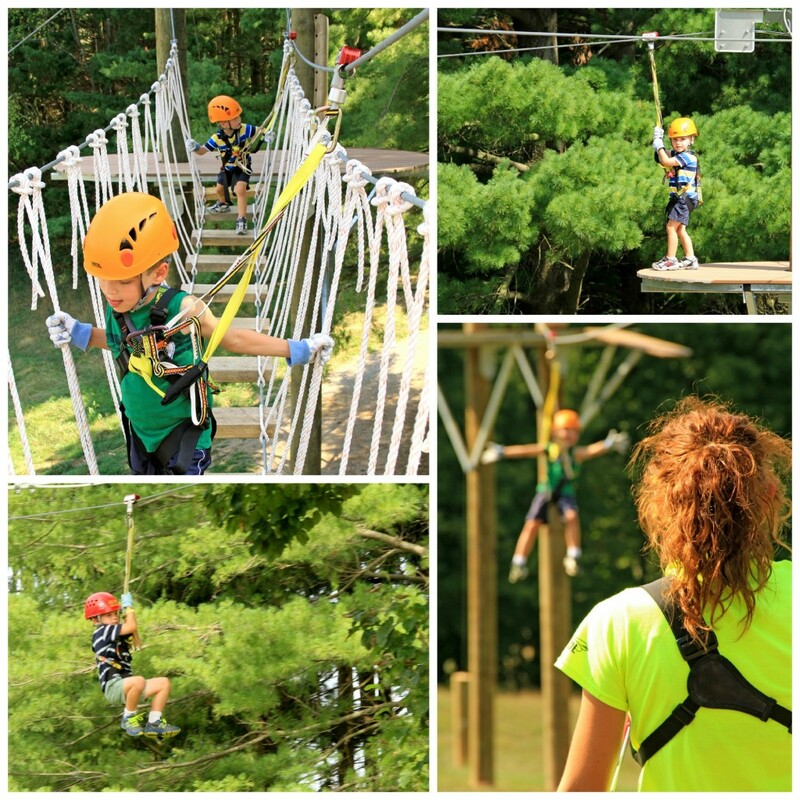 For younger kids too light for the regular tours, Hocking Hills Canopy Tours has designed their own course! Judging by the squeals and laughs I heard, the kids love it! Called the Dragonfly, this zip line adventure course includes eight kid-sized zip lines, three sky bridges and a sky tunnel. The course uses a “continuous-belay” safety system, the first of its kind in the industry, which means there are no transfers from one zip line to another. Kids’ safety harnesses are attached from start to finish. Dragonfly: Top Left: Kids on the bridge. Top Right: Ready for take-off. Bottom Left: Flying! Bottom Right: A guide watches her bird fly into the nest. 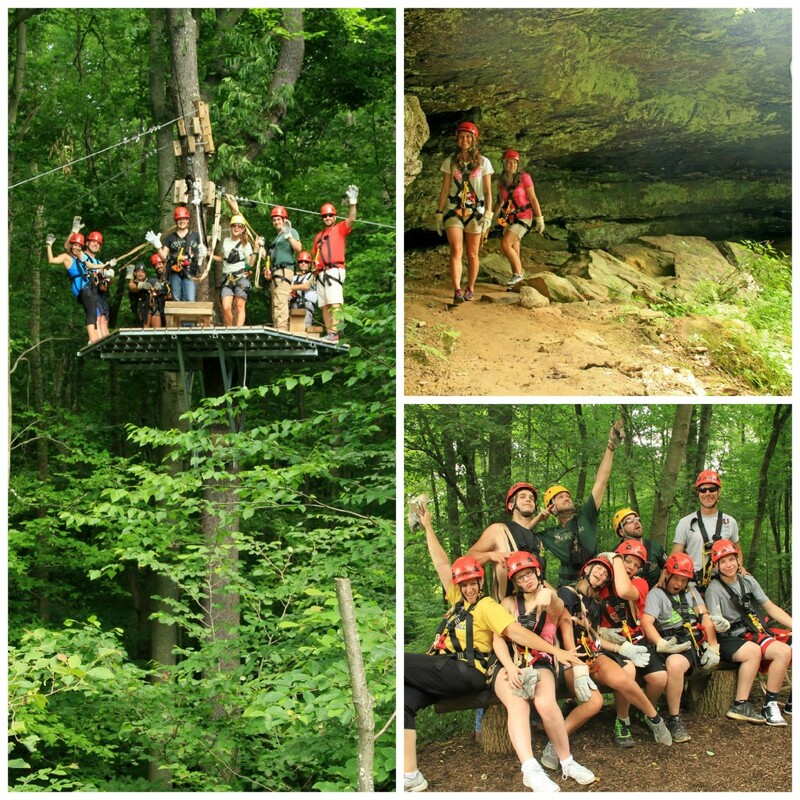 • Hocking Hills Canopy Tours reserves the right to refuse a rider for medical, safety or other reasons. Hocking Hills Canopy Tours offers nighttime zip tours where participants have head lamps and glow necklaces for a different way to experience the thrill. They also offer sunrise and sunset tours so guests can see the forest when animals are most active. Also new is the Off-road Segway Tour, a motorized Segway ride through the wilderness, even the mud! For landlubbers afraid to “fly,” this is a great alternative. While most tours run 2.5-3 hours, the prices and tour times vary by experience. Visit their website for complete information, including pricing, availability, height and weight requirements for each adventure, and reservations. To make a weekend away easy to plan, they include links to lodging options, restaurants, local shopping and other adventures in the area. Preferred partners offer a discount on packages to help you save. Before my 40th birthday, I was the world’s biggest chicken. I loved the series, The Amazing Race, but NOTHING would convince me to do much of what those crazy people did. Maybe you can relate? The thought of zip lining through the trees makes your knees buckle. I get it! I really, really do. For some reason, I celebrated my 40th birthday in Mexico by jumping off a cliff into a deep lagoon (sober, I might add). I realized I can do it! 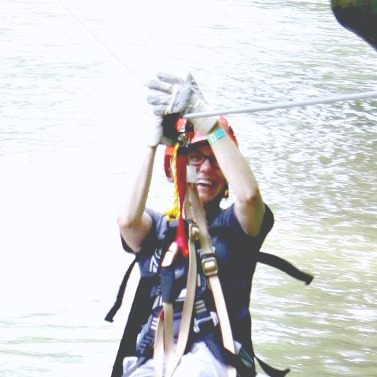 A few years later, I got to zip line for the first time, and I beat my fears. They were all in my head. The only two “scary” aspects about zip lining is looking over the edge from the platform to the ground (I don’t recommend it, if you are afraid of heights… just trust the harness). The second “scary” moment is the step off the platform to begin “flying.” But then…. it’s pure fun! The staff at Hocking Hills Canopy Tours takes safety seriously. They conduct training throughout the year, and they know how to help adventurers through the whole thing. In fact, before you ever get to the course, the staff takes you through a practice zip about 8 feet off the ground to make sure riders are comfortable. In my group, an older mom and her adult daughter were both afraid at first. By the fifth run, they had completely overcome their fears — and the mom even hooted and hollered as she took off! It was great! Bag holders, what do you say? Have I convinced you to fly? I was provided a free X-treme Zip Line Adventure and SuperZip ride in exchange for this review. All opinions stated here are my own. Please see my disclosure policy to learn more.